Sitting there witnessing the film unfold over 2 hours and 20 minutes, it’s clear there is a crisper, better movie in there somewhere, but director David Dobkin (Shanghai Knights, Wedding Crashers) never stops piling on the clichés, ultimately reducing The Judge to a kind of hokey made-for-television movie. I’m going with two-and-a-half out of five; watch it for Duvall and Downey who breathe life into a mediocre script. The Judge is a great example of meticulously-crafted character portrayals and a film that carefully builds up each of the main characters over the course of its duration., Hank might be the only one with the chops to defend his dad in a court of law, especially when the prosecution’s seasoned lawyer Dwight (Thornton) is hell-bent on winning. Concurrently, he also rediscovers his roots and even reconnects with a feisty old flame of his. This is a tale encapsulated simply enough within the deceptively simple parenthesis of a small-town family bonding saga. And of course, Downey and Duvall shine. With an uncomfortably high number of elements borrowed from an insane amount of places, The Judge is the refined, severely toned down version of basically every Yashraj/Karan Johar movie. This is Kabhi Khushi Kabhie Gham for Americans.Sure, it won’t make you bawl and pledge allegiance to oppressive traditions like karvachauth, it will definitely make you a bit more appreciative of whatever kind of family you have. If you’re still sitting here, reading this, wondering whether or not to watch The Judge, I’ve got two words for you — Robert, and Robert. Of The Judge’s rare noticeable lines, despite all that banter in court, there is only one worth remembering. When reminded of his avarice, Hank notes, “Everyone wants an Atticus Finch till there’s a dead prostitute in the tub.” Deep? Still trying to figure out that one. 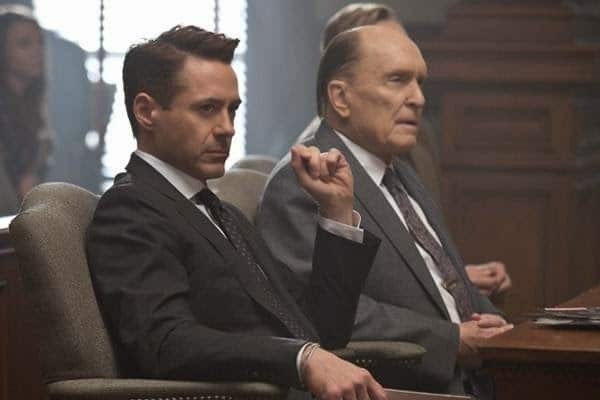 Robert Downey Jr. and Robert Duvall are the main highlights of the film. Despite the story being predictable, it’s a delight to watch two remarkable actors together on screen. Watch this emotional drama only if you are an ardent fan, and can be tolerant of excessive family drama. VERDICT: A melodramatic story, beautiful locations and Robert Downey Jr. at his best.